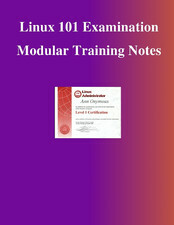 This course material is based on the objectives for the Linux Professionals Institute's LPI 101 examination (specifically, release 2 of the objectives). The course is intended to provide you with the basic skills required for operating and administering Linux systems. At every good training course the student should come away with some paper in his hand, to file in the company filing cabinet. A really excellent course will include some knowledge and practical ability in the student's head as well. We hope to achieve at least the first with these notes. The second is up to the instructor. This course aims to equip you with the knowledge to be able to pass the LPI 101 examination (release 2). We hope that in the course of doing this course you will acquire the skills that go with an understanding of how Linux works.